Visitor Guide to Islay in the Inner Hebrides of Scotland - includes details of travelling around Islay and enjoying the Islay's coast and famous distilleries. Islay (pronounced eye-la), the most southerly of the Hebridean islands and one of the most populous, with around 4,000 inhabitants, has one very important claim to fame - single malt whisky. Islay produces a very distinctive, peaty malt and connoisseurs are in for a treat, as the island has no fewer than seven working distilleries. Aside from whisky, people also come here to watch birds. The island is something of an ornithologists' wonderland, and from October to April plays host to migrating barnacle and white-fronted geese flying down from Greenland in their thousands for the winter. If that leaves you cold, then there's always the spectacular coastal scenery, from the wild Mull of Oa to the glorious beach at Laggan Bay. Compared to other islands like Skye, Mull or Arran, Islay receives few visitors, mainly due to its distance from the mainland, giving it a really isolated feel. Harbour Inn, Main St, Tel. 810330, Fax. 810990. 4 rooms. Completely refurbished to a high standard, great views across the bay and superb food in their acclaimed restaurant (mid-range/expensive). D Lochside Hotel, Shore St, Tel. 810244, Fax. 810390. 8 rooms. Friendly and good-value hotel with a mind-boggling selection of single malts. On the road between Bowmore and Port Charlotte, at Bridgend, is C Bridgend Hotel, Tel. 810212, Fax. 810960. 10 rooms, nice and peaceful and good bar meals. There are also several B&Bs in Bowmore. The places listed below are in and around Port Ellen. Four miles to the north, overlooking Laggan Bay, is Machrie Hotel, Tel. 302310, Fax. 302404, 18 rooms. Golfing hotel right by a great beach and a great golf course, does golfing packages. The bar and restaurant make the perfect end to 18 perfect holes. Also by the golf course is the excellent B-C Glenmachrie, Tel./Fax. 302560. 5 rooms. A genuine farmhouse offering genuine hospitality and superb food. The price includes dinner, and you'd be crazy to book B&B only and deny yourself the pleasure. Nearby is D Glenegedale House Hotel & Restaurant, Tel. 302147, Fax. 302210, which is very handy for the airport. At Kintra beach (take the Oa road and follow the signs for Kintra) is E-F Kintra Farmhouse, Tel. 302051. Open Apr-Sep, 3 rooms. 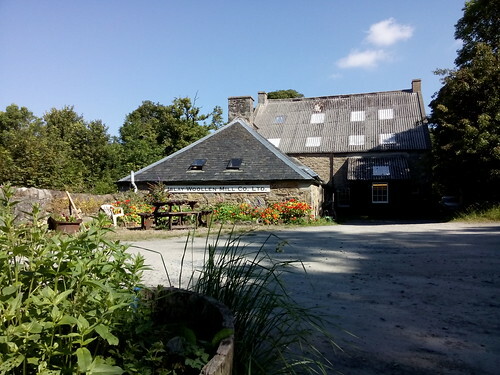 Also an independent hostel, the F Kintra Bunk Barns Hostel, Tel. 302051, open Apr-Sep, and a very good restaurant (see below). 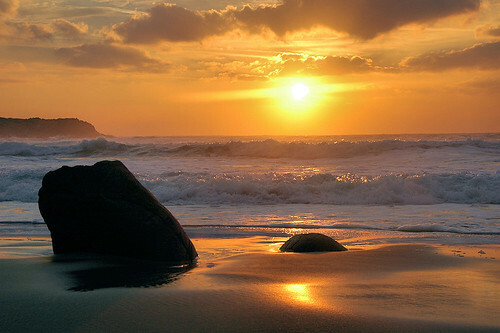 This is a great place for camping, and there's a campsite with full facilities (open Apr-Sep). There are several places to stay in the village itself. E The Trout-Fly Guest House, Tel./Fax. 302204, is right beside the ferry terminal and has a decent restaurant (for residents only). E The Bothy, 91 Lennox St, Tel. 302391, Email The Bothy Run by the versatile Mick Stuart who also hires out bikes and acts as a wildlife guide. Keen divers might want to try the Islay Dive Centre, 10 Charlotte St, Tel. 302441, which has apartments to rent (E). Apart from the places mentioned above, there's very good, cheap food available at the Old Granary at Kintra Farm, Tel. 302051, open 1730-2300, Jul/Aug 1200-2300. Islay can be reached by air from Glasgow. The airport is at Glenegedale, a few miles north of Port Ellen on the road to Bowmore. The ferry to Islay (and Jura) from Kennacraig to Port Ellen (2 hrs 10 mins) sails 1 daily on Mon and Sun and 2 daily on Tue, Thu, Fri and Sat; and to Port Askaig (2 hrs) 1 daily on Tue, Wed, Thu, Fri and Sat and 2 daily Mon. The ferry from Oban to Port Askaig sails on Wed (4 hrs 15 mins). From Colonsay to Port Askaig (1 hr 10 mins) there is a sailing on Wed. CalMac offices: Kennacraig, Tel. 01880-730253; Port Ellen, Tel. 01496-302209. It takes about 2€ hrs to drive to Kennacraig from Glasgow, and there's a daily bus from Glasgow to Kennacraig (with West Coast Motors) which connects with the ferry to Islay (for bus times, contact Buchanan Street bus station, Tel. 0141-3333708, or Traveline Tel. 0870-6082608). Because the island is partially Gaelic-speaking the road signs are bilingual. For those without their own transport, there's a regular bus service around the island, with Islay Coaches, Tel. 840273, and Royal Mail Postbuses, Tel. 01246 546329. For car hire there's D N Mackenzie at Glenegedale, Tel. 302300. Taxi hire at Carol's Cabs, Frederick Cres, Port Ellen, Tel. 302155. Bicycle hire at Port Ellen Playing Fields Association, Tel. 07831-246911; the Post Office, Bowmore, Tel. 810366; and Mick Stuart, Lennox St, Port Ellen, Tel. 302391, who is also a wildlife guide. The Western Isles are home to some of the classic whisky distilleries whose distinctive peaty flavour are world renowned. 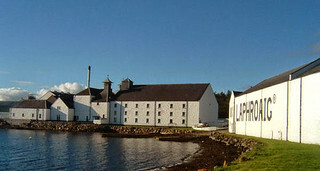 Here is a quick list of the main Islay whisky distilleries. Though the whisky distilling process is basically the same everywhere, some distilleries have more beautiful locations and more interesting tours. 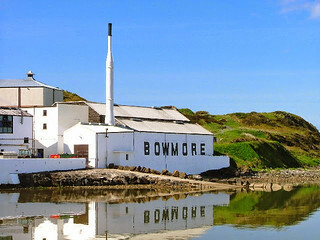 Islay's seven distilleries enjoy the most scenically stunning settings and are full of character and history. 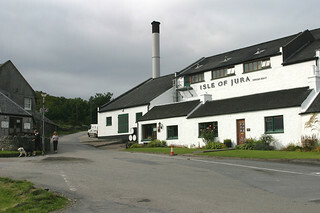 Islay also offers the unique opportunity to visit several of Scotland's most impressive distilleries in one day, and their distinctive peaty malts are considered to be among the finest. Laphroaig (pronounced 'la-froyg') is the closest to Port Ellen, and its wonderful setting is summed up by its name, meaning "The beautiful hollow by the broad bay" in Gaelic. According to many this is the ultimate in malt whisky and is at its best after dinner. The free distillery tours are by appointment only, Tel. 302418. Lagavulin (pronounced 'laga-voolin') is a mile along the shore by the romantic ruin of Dunyveg Castle. Their 16-year-old single malt is one of the classics and also makes the ideal after-dinner tipple. They also offer a very interesting tour (£3), Monday-Friday by appointment only, Tel. 302400. 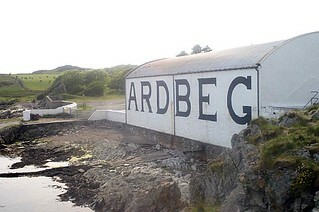 Ardbeg distillery is a mile further east and produces a robust and powerful single malt. Established in 1815, it was closed for a while, but was recently acquired by Glenmorangie and runs tours (£2) Monday-Friday from 1030 till 1530, and also on Saturday and Sunday June-August, Tel. 302244. Bowmore is the oldest distillery on Islay and still uses all the old traditional methods to produce its fine single malt, also at its best after dinner. Their hour-long tours are the most professionally done and even include a video. Tours (£2) all year round from Monday-Friday at 1030 and 1400, in the summer months at 1030, 1130, 1400 and 1500, Tel. 810441. Caol Ila (pronounced 'coal-eela') was founded in 1846 and lies close to Port Askaig, with great views across the Sound of Islay to Jura. Unlike most of its island peers, this single malt is best before dinner. Tours of the distillery (£3) all year round by appointment only, T840207. 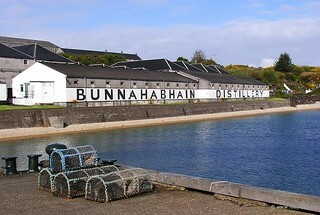 Bunnahabhain (pronounced 'bun a havan') is the most northerly of the distilleries, set in a secluded bay with great views across to Jura. Free tours are also by appointment only, Tel. 840646. Bruichladdich (pronounced 'brook-laddie') is in the village of the same name on the road south to Port Charlotte. Recently voted distillery of the year by the readers of America's Malt Advocate. 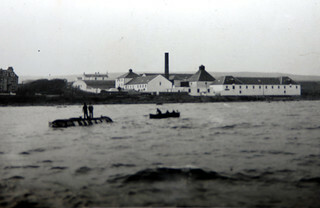 They offer tours (£3) all year round Mon-Sat at 1030, 1130 and 1430, see website: Bruichladdich. 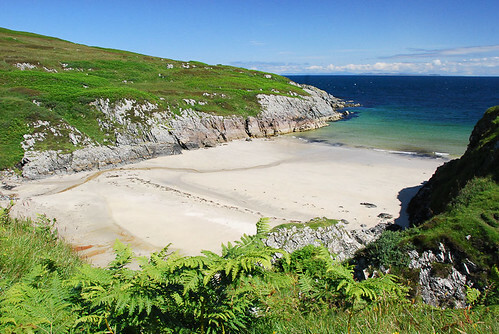 Beautiful beach on the North West of Islay with white sand. 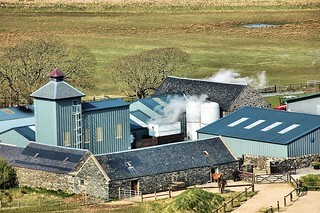 Small farm distillery established in 2005 and the first distillery to be built in quarter of a century. Whisky distilling in the old craft style! The Ardbeg distillery that has been producing whisky since 1798,has won many awards in international spirit ratings competitions. Another of the legendary Islay whiskies: this one is different as you can actually pronounce the name! 130 year old Islay distillery with very traditional methods and a very strong sense of place. Still independent. Located in a quiet cove near Port Askaig,over-looking the Paps of Jura Caol Ila is located in one of the most unexplored parts of the country. Legendary Islay whisky that like so many others is difficult to pronounce. 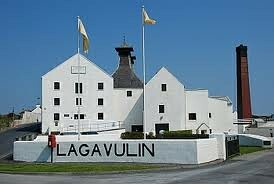 For many, their favourite Islay tipple. 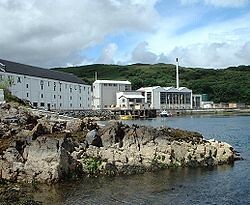 One of the three great whisky distilleries beyond Port Ellen on Islay that are as close as the whisky world gets to mecca! Located on rugged island just 30 miles long, this distillery is one of the landmarks of this island, which has only one road and one hotel. Worth a visit. Tigh Cargaman offers wonderful views over Kilnaughton Bay and the Oa (pronounced “Oh”) peninsula, and on clear days the hills of Antrim, Northern Ireland are clearly visible. The beach is at the end of the garden (over a road), and the island Maltings and the old Port Ellen Distillery are close by. Tigh Cargaman Holiday Cottages have three cottages built in 1842 for the Port Ellen Distillery manager and available all year around. Accommodation is somewhat limited in Port Charlotte. The best place to stay is the Port Charlotte Hotel, Tel. 850361, Fax. 850361. 10 rooms. Restored Victorian inn with gardens and conservatory on seafront; their restaurant features local seafood and is the best around. There's also a B&B E Mrs Wood, Tel. 850225, open Apr-Oct; and a SYHA hostel, Tel. 850385, open Mar to end-Oct, next to the Wildlife Information Centre. Aside from the hotel, the best place to eat is the Croft Kitchen (Tel. 850230). It's a coffee and gift shop by day and moderately priced restaurant by night, open Mar-Oct daily 1000-2030, best to book in season.